You can’t go wrong putting your kids in this camp! This is the PERFECT one day camp for any child that is a chocolate lover. This camp is put on by Certified Chocolatier Jeff Slaughter. 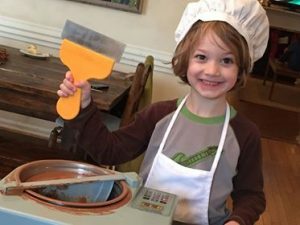 During the four-hour experience, your child will learn: the history, geography, science, math, vocabulary and art of chocolate. PLUS, your child will go into the “Chocolate Kitchen” and make their own chocolate to bring home! From personal experience this chocolate is the absolute best! The camp dates are June 3rd, 4th, 5th and 10th from 9 a.m. to 1 p.m. Sign up soon because some dates are already filling up. For more information on this camp, click here. Camp SOS is offered for kid’s ages 4-7 years old. It is an opportunity to gain more confidence in swimming while also having fun in the water! The camp runs Monday-Friday; 8:30 a.m. to noon. Activities include: swim lessons, water playtime, arts and crafts, story time and a snack. You can attend for just one week or every week. Make sure to register quickly for this only allows 10 campers each week. Location: The Swim School has locations in Bossier City and Shreveport. Do you have a ballerina or princess in your household? The camps that Dance Loud Academy is offering this summer will be a great fit for them. They will have crafts that match the theme and they also decorate the studio to bring the camps to life! The two camps being offered are: a Princess Ballerinas Frozen Wonderland Camp held June 10th & 11th from 4-5 p.m. for ages 4-6 and A Day at the Beach Camp held June 15th from 11 a.m. to 1 p.m. for ages 3-5. For more information about these camps, click here. will learn creative problem solving, STEM application, innovation and confidence. Camp Invention is a nationally acclaimed summer program where STEM concepts come to life. This camp is hosted by the Robinson Film Center, but it is being held at the Bossier Arts Council. Who doesn’t want to be a super hero? This is a brand new camp being offered this summer. Students will learn the ins and outs of filmmaking and get to create their own live action super hero film by the end of the week. The camp is open to students who have completed grades third through eighth. The camp will be held from June 17th-21st from 1-5 p.m.
For more information about this camp, click here. Hulafrog. Make sure to also check out our Summer Camp Hot List coming out later this month. Rachel Penwell is the Managing Editor of Hulafrog Shreveport. She is a lifelong resident of the Shreveport-Bossier area.. She is the mom of 10-year-old twins and loves getting out to find fun things to do. At Hulafrog, their goal is to highlight all the family-friendly events and businesses in the area.